Taking pictures of food is a fun and inexpensive niche of photography. In the beginning, you will just pull out your camera and take shots of your food at dinner or in a restaurant. But sooner or later, you will want to get better, more professional-looking results. This article gives five great tips for better food photography. Look at other food photographs. You can do this everywhere. Flip through magazines, surf the web, or look at menus and artwork in restaurants and grocery stores. You will not only come up with a lot of great ideas, but also see how the food is arranged and where the light is coming from. Practice by trying to emulate what you see in these photographs. Get some solid-colored plates, dishes and glasses. Hit yard sales, discount stores and dollar stores to accumulate a handful of simple tableware that won’t compete with your shot. On the same subject, keep the backgrounds simple. Plain white countertops, solid wood tables, and simple tablecloths work best. Use paper napkins, paper towels and placemats to add some texture and interesting focal points without pulling interest away from the main subject. Folds and wrinkles will also add some contrast and shadows to your light. Try both monochrome and contrasting backgrounds. A white bowl on a white plate on a white counter can produce dramatic high key images, but they can be tricky to light. On the other hand, use a lot of contrasting and complementary colors to add splash and vitality to the image. Don’t just shoot the final meal if you are shooting at home. Take shots of each step of the process, from whole raw vegetables, cutting up ingredients, the cooking process and finally, plating each element. You’d be surprised how often one of the early shots will come to be a favorite. 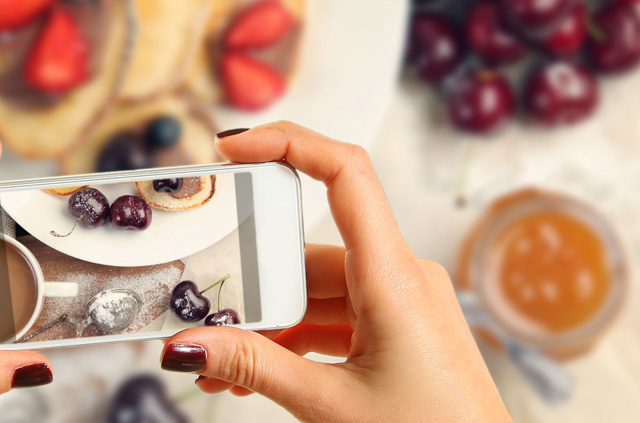 Practice these tips and shoot a lot, and your food photography will rise to a whole new level.